With this declaration, the signatories want to clearly articulate the cohesion in art and culture as part of civil society against populist and nationalist movements. With this declaration, the artists and cultural workers set a socio-political signal that intervenes in our daily practice. We show together, nationwide, an attitude for tolerance, diversity and respect. At the same time, the Declaration of the Many will be presented in Berlin, Düsseldorf and Hamburg. Art creates a space to change the world. As cultural workers in Germany, we do not stand above things, but on a soil from which the greatest state crimes in the history of mankind were committed. Art was defamed as “degenerate” and culture was abused nationwide for propaganda purposes. Millions of people were murdered or went into exile, including many artists. Today we understand art and its institutions, museums, theatres, studios, clubs, urban and rural places of culture as open spaces belonging to many. Our society is a plural assembly. Many different interests meet and often find themselves in between. Democracy must be renegotiated every day – but always under one condition: it is about all, about each*n individual*n! The ground on which we stand together is the Basic Law. Right-wing populism, which attacks cultural institutions as actors of this social vision, is hostile to the art of the many. Right-wing populist groups and parties disrupt events, want to interfere in the programme of events and the programme, polemicise against the freedom of art and work on a renationalisation of culture. Their contemptuous treatment of people on the run, of committed cultural creators, of those who think differently, reveals how they intend to deal with society as soon as the balance of power changes in their favour. In our federal state Saxony Pegida, Identitäre Bewegung and AfD work hand in hand and polemicize against the democratic cosmopolitan society. We oppose this. The undersigned art and cultural institutions engage in open and critical dialogue on right-wing populist strategies that undermine basic democratic values. They shape this dialogue with participants and the public in the conviction that the participating institutions have the task of further developing our democratic society. All signatories promote debates in the spirit of democracy, but do not provide forums for propaganda of any kind. We fend off attempts by right-wing populists to exploit cultural events for their own purposes. We show solidarity with people who are pushed to the margins of society by a right-wing populist policy. It is about all of us. Hence: art for democracy! All signatories are cultural institutions, art institutions, art educating institutions, theatres, museums and their interest groups or associations. By signing the declaration, the directors or the management team agree to make the text of the declaration known and open for discussion within their own organisation among employees, ensemble members, curators, audience and visitors. The declaration will be published on the website, in programme booklets, as a notice in foyers or in any other suitable form. The undersigned cultural institutions will be made visible on the homepage www.dievielen.de . The golden-glittering rescue blanket, the symbol of the many, will be used in connection with the Declaration, depending on the corporate design of the institutions. The signatories prepare information events, discussions and activities in the sense of the declaration, the dates are communicated together. Within the framework of their own press work and a central press conference, the declaration and the campaign will be published on 9 November 2018. 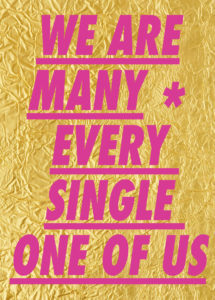 The campaign for the declaration of the many has a regional character and will be carried out by regional associations of cultural institutions as “Berliner, Düsseldorfer, Dresdner, Hamburger and many more”. Declaration of the Many” nationwide. In addition to the first signatory cultural institutions, other cultural institutions, individuals and groups of artists* may also declare their consent as supporters from the date of first publication in a region. The undersigned institutions are actively participating in a nationwide campaign with action days, dialogue forums and the mobilisation to a “Shining Demonstration of Art and Culture – Solidarity instead of Privileges”. It’s about everyone. Art remains free” for May 2019. 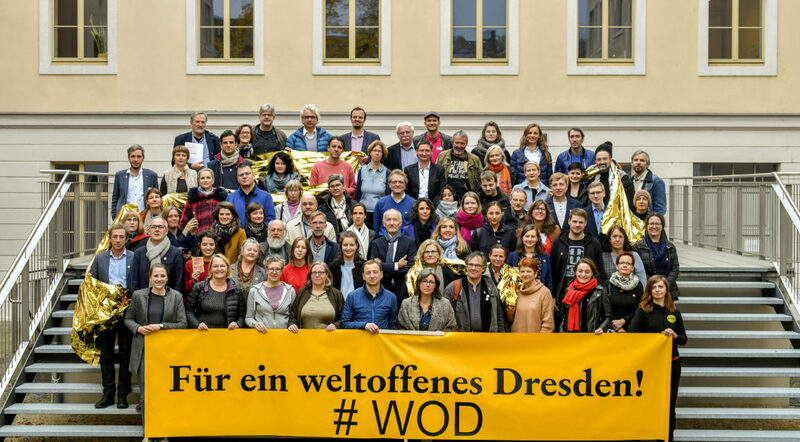 The signatories commit themselves to mutual solidarity with cultural institutions and actors* in the arts who are put under pressure by agitation and blasphemy.The Dresden Declaration of the Many was initiated by “#WOD – Initiative weltoffenes Dresden”.WE ARE MANY – EVERYONE*R SINGLE OF US! In its countless forms, art expresses the diversity made possible by a freedom of expression in societies. In its fullness, it reflects the peculiarity and individuality of the people who make it, and often opens completely new perspectives on the world to those who hear, see, feel it. Art can shape communities and identities and accompany their living change. Art, just like science, can be involved in the constant reactivation and cultivation of a self-reflexive social discourse through critical attitudes and discussions. Dresden’s cultural vitality and rich artistic creativity are for many the spirit of the city today. The freedom that makes this possible must continue to be preserved here, and it needs people who stand up for values of freedom and an atmosphere of togetherness, especially when threats are raised. In autumn 2014, “#WOD – Initiative weltoffenes Dresden” was founded as an open association of Dresden’s cultural institutions to do just that – to jointly set an example for freedom, democracy and an open society based on solidarity. In times of increasing anti-democratic tendencies, the “#WOD” association provides impulses from civil society for a reflective, critical, but also respectful approach to our democratically constituted free society. It is precisely in these times that art and culture can build bridges, as well as where it is no longer politically possible. Dresden’s cultural institutions are common places of reflection, of enduring and testing difference and of questioning and confirming identity. Jüdische Musik- und Theaterwoche Dresden e.V. Villa Wigman für Tanz e.V.